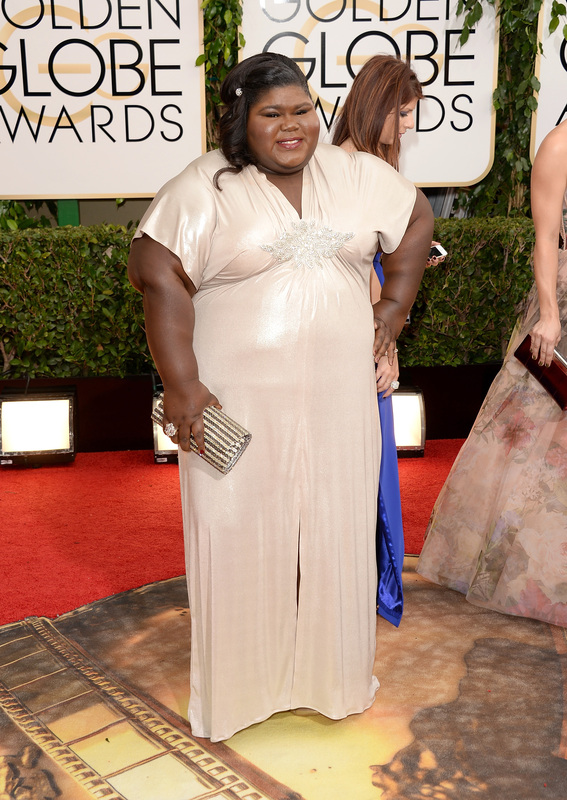 Actress Gabourey Sidibe may not have made many best-dressed lists for her Golden Globes red-carpet appearance this past Sunday, but the American Horror Story: Coven and Precious star took a little more pointed heat than most others on the red carpet. After hitting the Globes in a shiny Michael Costello gown, red carpet viewers everywhere attacked with cruel, critical comments about Sidibe’s weight and appearance. Though she played it off in the coolest way possible, all the fat shaming from Twitter critics did little to keep the focus on just how luminous Sidibe looked on the Golden Globes red carpet, even if she wasn’t one of the best dressed stars of the night. Her simple gown was a huge improvement over the printed mess of a dress she wore the 2011 Golden Globes ceremony, and her swept-back hair did wonders for bringing out her gorgeous face. Not to mention, she nailed the minimal-chic look with stunning-but-simple Neil Lane jewels and a beautiful Bordeaux pout. It wasn’t the first time she’s worn this shade of cream, and we hope it won’t be the last, as the shiny silk fabric really pops on her glowing skin. For years, Sidibe has been proving that haters’ comments do little to stir her or shake up her personal style. And it shows in the confidence she projects on the red carpet, whether she’s wearing an off-the-shoulder Marchesa gown or an all-black cinched sequin number. This year's Golden Globes were no exception, and no matter how hard they tried, ill-willing critics couldn’t bring her down. The actress looked happier than ever at the Golden Globes after parties, hanging out in style with actress Sarah Hyland and American Horror Story co-star Taissa Farmiga. Criticism or not, it looks like Sidibe will live to shine another day.